It is against federal regulations in the federal Fisheries Act to deposit brine into a body of water where fish frequent. The public has lost all faith in government as they have allowed Alton Gas to receive their provincial permits while knowingly breaking federal laws by dumping 260 ppt at a rate of 10 000 cubic meters per day, which is a release of a deleterious substance. 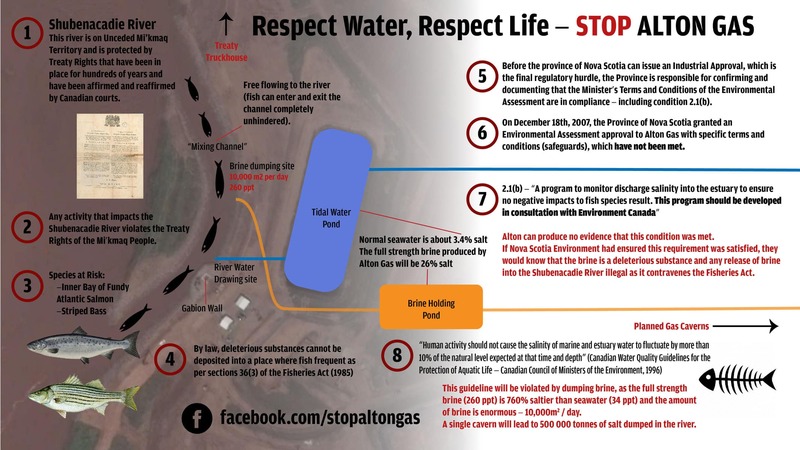 Alton Gas has also not acquired consent from the Mi’kmaq Nation and their design will knowingly violate the Treaty Rights of Mi’kmaq. It is both the provincial and federal responsibility to protect the water and fish habitat by law. At this time it appears both federal and provincial governments are knowingly protecting Alton Gas instead of protecting fish habitat and Treaty Rights. This needs to stop now. The laws are in place, it is now your duty as the government to suspend all permits and charge the company. We know that the law has already been broken because the province of Nova Scotia failed to get clearance on 2.1(b) in the provinces terms and conditions of the Environmental Assessment. By not getting clearance they failed to up hold federal laws. Failing to not check off 2.1(b) is a prosecutable violation of the Nova Scotia Environment Act. When will the permits be revoked? When will the government upload the Fisheries Act and tell Alton Gas their project is against federal law and cannot go ahead? When will the Nova Scotia government uphold the Nova Scotia Environment Act? How can this project have received permits without consent or proper consultation from the Mi’kmaq when it will cause serious harm to fish and fish habitat protected by Treaty Rights? How can the govt allow this to happen this is ludicrous, something terribly wrong with the decision makers totally off their rockets!! !